Intel wants to be taken seriously in the discrete gaming GPU market, and its gaming division general manager, Frank Soqui, believes the company traditionally wrapped up in x86 has the capability, expertise, and drive to offer genuine competition in the market dominated by Nvidia and AMD. Intel’s visual computing team led by ex-Radeon chief Raja Koduri aims to get its first discrete graphics product onto the market by 2020. 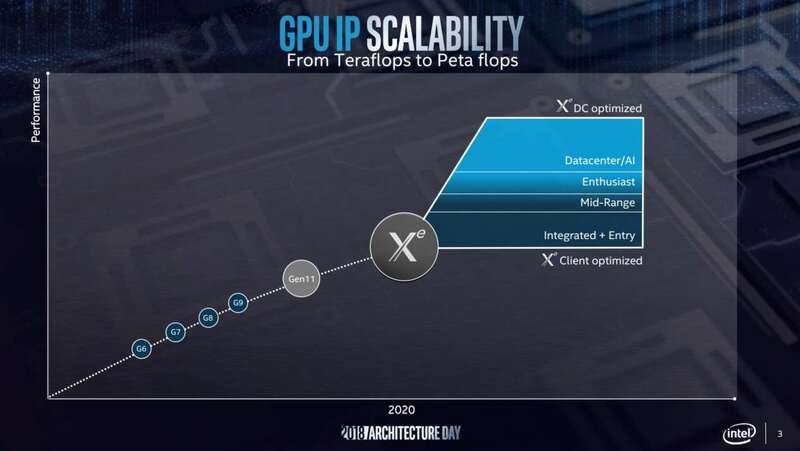 Rising up from the foundations laid out by its Gen11 integrated graphics venture, the company is hoping to compete in “a broad range of computing segments”, including gaming, with its high-end discrete GPU: Intel Xe. And Soqui believes a third player in the GPU market can only be beneficial to everyone, even Intel’s steadfast rivals in the industry. Intel has remain tight lipped about its upcoming GPU and the architecture powering it, however. All we know is that it intends to shape its “core IP base” from its integrated Gen11 graphics into discrete form. That likely means Intel’s execution units (EUs) will form the basis for its designs – everything from the entry-level product all the way up to AI and datacenter applications. Intel recently announced ‘The Odyssey‘: a community feedback program to workshop its discrete graphics product and keep its community in the loop regarding new developments. Alienware and XPS VP, Frank Azor, has expressed the opinion that it will take time for Intel to get up to speed with the competition. Yet Soqui was confident that the move from integrated to discrete graphics technology will not pose a difficult transition for the company. The company seems confident as ever that it will get the job done by 2020 – a lofty goal that is surely on the mind of many an engineer in the company’s Core and Visual Computing Group as each day ticks by. Yet the results could, as Soqui believes, be monumental for the GPU market. The ensuing pricing and R&D battle between Intel, Nvidia, and AMD as they fight for gamer’s love and attention can only be positive for the market as a whole. Let’s just hope Intel’s engineers are as confident as its executives. Co-authored by Jess Wells and Jacob Ridley.